Almost every blogger or writer is obsessed with traffic statistics. Having a good knowledge of your traffic statistics can encourage you as a blogger to write more but most importantly can give you an insight into your best performing articles, keywords, search engine performance, traffic sources, percentage of new visitors and returning visitors etc. However, there are WordPress plugins that can help publishers and webmasters have a good knowledge of their site behavior through its traffic statistics. These plugins will give you a view into the number of people that visits your site, how long they spend on the site, what articles they are most interested in and many more. Today i want to discuss the “Top 5 WordPress Plugins to manage Traffic Statistics” of your site so as to analyze and understand your site’s traffic behavior as to be able to take advantage of this knowledge in improving your site. Most analytics and website statistics services are overwhelming and difficult to understand. Jetpack by WordPress.com plugin makes the most popular metrics easy to understand through a clear and attractive interface. JetPack by WordPress.com has many other features to help enhance your blog experience, but the stats feature is a great part of the JetPack.com that will make it a must have on your blog. It presents to you the number of views for each article in a manner that is clear and easy to understand. 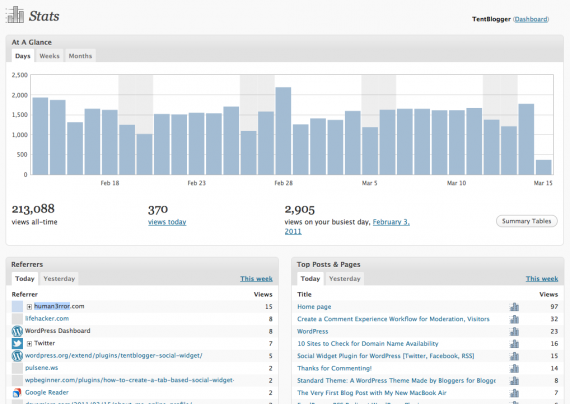 Your all-time blog visits will also be shown to you. You do not need to worry about sites that link in to your blog, as JetPack will help you display all the possible sites that have sent traffic to your site, be it a search engine or social media. You can rely on JetPack for a fair accurate traffic statistic to your site. Simply install and activate the plugin and connect with your WordPress.com account to enjoy the statistics feature of JetPack and its other awesome features. 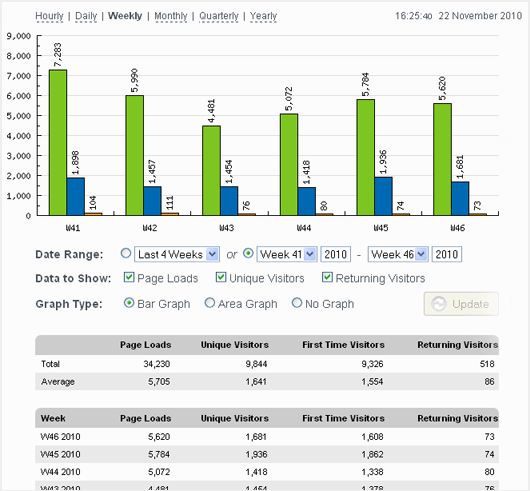 Jetpack by WordPress.com is a great plugin to manage traffic statistics in WordPress. The WP Statistics plugin is designed to help publishers and developers, analyze the traffic that come to their site. The Publisher view traffic that has come into their site for up to one year prior to the current date. Publishers can also break down their traffic flows based on specific date ranges – the current day, the previous week, the previous month, or specific ranges in mind if wanted. The WP Statistics just like the JetPack by WordPress.com will show you the number of sites that have referred visitors to the site. It will also show you the search terms that has driven the most traffic to your site. WP Statistics can also give you an insight into your site’s performance on the search engines and the amount of traffic from the search engines be it from Google, Bing , Yahoo or any other search engines. When visitors come to your site through the social media sites like Facebook, you will also be notified and the number of visits that came through the other social media sites. The WP Statistics is a very important Plugin to help you analyze your site’s traffic and understand your site’s traffic behavior better. 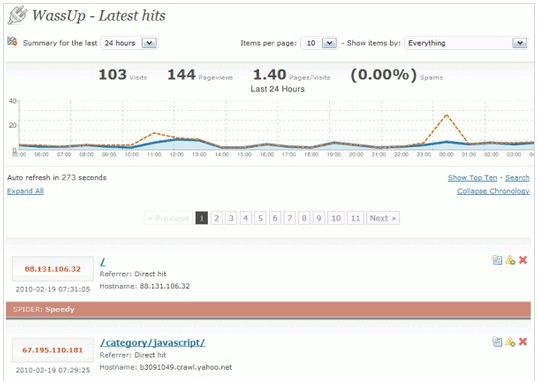 The Wassup Realtime Analytics is another great plugin to manage your site’s traffic. It is a little bit different from the WP Stattistics. While the Wassup plugin takes on many of the same functions as the WP Statistics plugin – range of searches, traffic filtering, source of traffic, and more – but instead of updating on a periodic basis (every day or so, for example) it updates your statistics on a real-time basis. It has graphics which can be displayed on the site for visitors to view or displayed only on the WordPress dashboard. In addition to picking up referral links from other pages or search engine results that bring you visitors, the Wassup plugin will also pick up traffic that comes from RSS feeds. 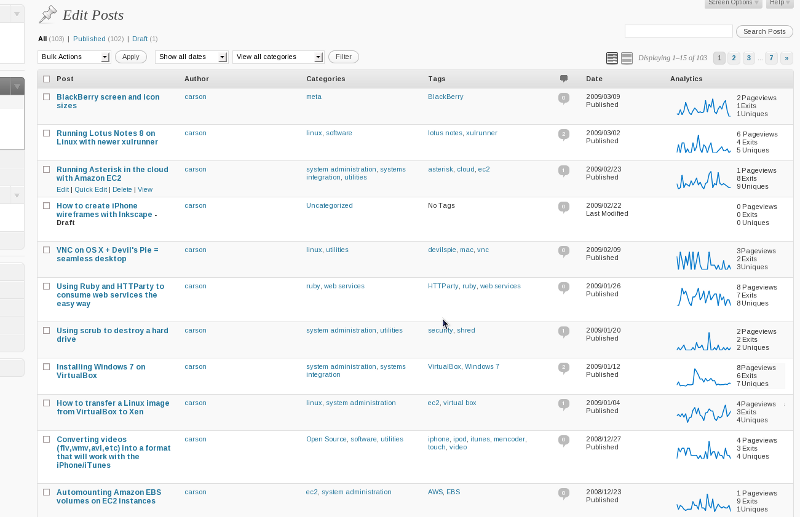 Most of the Stats manager plugins might not display the users that viewed your site via RSS readers. This is what makes the Wassup plugin different and very useful for publishers and developers. Google Analytics Dashboard Plugin is a very great and popular plugin, used by most bloggers and writers to analyze their website traffic to the fullest. After installing this plugin, the publisher is expected to provide Google analytics information in the WordPress dashboard, in order to track statistics related to their website. Data regarding your site is completely available within the new dashboard widget available after the plugin installation. Google analytics can be made private or made available to your visitors, which will include your potential advertisers. Google Analytics dashboard is one essential plugin to have on your WordPress blog, in other to fully manage your traffic Statistics. 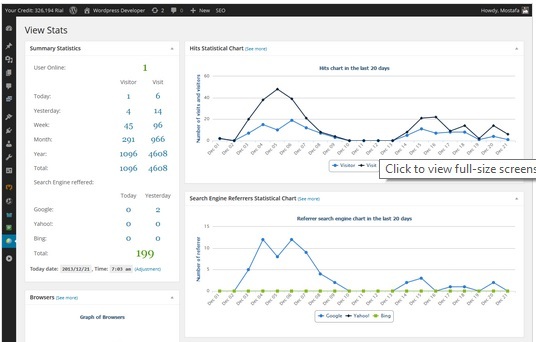 StatCounter is yet another WordPress plugin to manage your traffic statistics effectively. The plugin provides great insight into your site’s traffic and provides you with important reports necessary to understand your site’s traffic behavior. With StatCounter you can keep track of your entry and exit pages, keyword analysis, source of traffic, search engine wars, visitors path and length, number of returning visitors, popular pages, incoming traffic sources, search engine performances etc. The good thing is that StatCounter does not consume your hosting resources like bandwidth and memory as its data is stored on its own server and served to your from there. So the plugin does not add any load to your server. Conclusion: These 5 WordPress Plugins listed above will help you fully understand and manage your site traffic. With the information provided by these plugins you will be able to know if your contents are being read and how many people read your contents so you can either improve in your content quality of maintain your standard. You can also be able to tell what sites send traffic to your site and how many search terms also are driving traffic to your site, so as you can be able to improve your blog based on these information. Did I omit your favorite WordPress plugin for managing traffic statistics? Let me hear it, which do you use for your WordPress site? Have you used any of the listed Plugins here? How did you find them? Use the comment form below to share with me and reasons why it is your preferred choice. Remember to subscribe to my blog. I think JetPack is a really great tool and must have plug-in for ever blogger. Nice complement to Google Analytics. Thanks Apollo for your contribution. nice info bro. also how can i measure my traffic stats using google analytic or webmaster tool? why your keyboard keys never last and measures to take. I have JetPack, but don’t use the traffic analyzer. Instead, I use the plugin that displays my Google analytics on my dashboard. These are the main plugins for traffic stats, no doubts. I have always been a fan of Statcounter and have used it for many years now. Anyway, thanks for writing this, Collimoto. It should help anyone looking for the right statistics plugin to use for their blog. And thanks to Nwosu for sharing this on Kingged.com, by the way. I found it helpful and have “kingged” it. I’m using StatCounter for the last few years and what I most like about it is they provide the complete keywords ranking details when user clicked to reach on your website. But this statistic has come down since Google introduced “Not Provided” for the search term. Yes Google hides search terms for logged in users to protect them and this has affected all traffic stats plugins. Its good to be reminded about the need to manage traffic statistics with the right plugins. These tools offer helpful features that can be applied by the blogger. I would to checkout how the Wassup Realtime Analytics work. This is the only plugin new to me! I have left this comment in kingged.com the Internet marketing social bookmarking website where this post was syndicated. Thank God you all found the traffic statistics plugins very useful. Its very nice for every blogger to measure the volume of traffic he or she is getting for his or her blog. I will be switching over to it already. Great list of plugins. I currently use Jetpack. Which one do you find to be the most accurate? wonderful list of blogs to get stats of a blog. I’ve used jetpack for tracking traffic and I think it’s really useful to track the traffic. I never tried any of other plugins, seems like I need to give a try. Wassup Realtime Analytics – realtime tracker in WordPress. One of the best realtime Worpress plugins that will help you manage your topic statistics. For those who wanted to use this, note that this is incompatible with page-based caching plugins such as “WP Super-Cache”. Really nice article but i am using blogger platform but soon i will purchase wordpress hosting so thanks in advance for this article. Thanks for the information, all 5 of the are good but I think that JetPack is the best. Please provide more information about good SEO plugin.